K3 Infotech (K3I) is a Mumbai based firm that was established in 2000 and offers services in the field of Technical Writing (Documentation) & Instructional Designing. 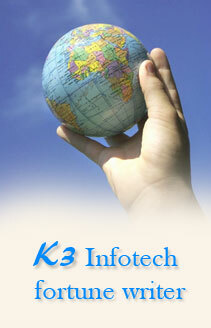 K3I is committed to provide the highest levels of services and training to clients by using cutting-edge technology. K3I works as a link between the product and key users. Our aim is to transform technical concept into user friendly language. The Company is expanding its horizon to newer cities in India and around the globe. K3I is one stop shop solution for your documentation needs. K3I offers entire array of documentation services that consists User Manual, White Paper, Training Manual, Reference Manual, Release Notes, Corporate Presentations, Flyers, Brochures etc. The Company has a team of excellent trainers in technical writing & instructional design. Why your organization needs K3I? If your Organization doesn't have "key" people. We will provide resources for writing or training project. To accompany your product with well-written documentation. To write training manuals for your employees. To achieve the goal / productivity by full-fledged training to employees.